What Facts Should I Know about Sleepwalking? When Should I Call the Doctor about Sleepwalking? What Are the Exams and Tests to Diagnose Sleepwalking? Are there Home Remedies for Sleepwalking? What Is the Medical Treatment for Sleepwalking? Is Other Therapy Available for Sleepwalking? What Is the Follow-up for Sleepwalking? How Can I Prevent Sleepwalking? What Is the Prognosis for Sleepwalking? What is the medical definition of sleepwalking? Sleepwalking is characterized by complex behavior (walking) accomplished while asleep. Occasionally nonsensical talking may occur while sleepwalking. The person's eyes are commonly open but have a characteristic glassy "look right through you" character. This activity most commonly occurs during middle childhood and young adolescence. Approximately 15% of children between 4-12 years of age will experience sleepwalking. Generally sleepwalking behaviors are resolved by late adolescence; however, approximately 10% of all sleepwalkers begin their behavior as teens. A genetic tendency has been noted. There are four stages of sleep. Stages 1, 2, and 3 are characterized as non-rapid eye movement (NREM) sleep. REM (rapid eye movement) sleep is the sleep cycle associated with dreaming as well as surges of important hormones essential for proper growth and metabolism. Each sleep cycle (stages 1,2,3, and REM) lasts about 90-100 minutes and repeats throughout the night. Thus the average person experiences 4-5 complete sleep cycles per night. Sleepwalking characteristically occurs during the first or second sleep cycle during stage 3. Due to the short time frame involved, sleepwalking tends not to occur during naps. Upon waking, the sleepwalker has no memory of his behaviors. Sleepwalking occurs more frequently in identical twins, and is 10 times more likely to occur if a first-degree relative has a history of sleepwalking. Drugs, for example, sedative/hypnotics (drugs that promote sleep), neuroleptics (drugs used to treat psychosis), minor tranquilizers (drugs that produce a calming effect), stimulants (drugs that increase activity), and antihistamines (drugs used to treat symptoms of allergy) can cause sleepwalking. The length and depth of slow wave sleep, which is greater in young children, may be a factor in the increased frequency of sleepwalking in children. Conditions, such as pregnancy and menstruation, are known to increase the frequency of sleepwalking. Episodes range from quiet walking about the room to agitated running or attempts to "escape." Patients may appear clumsy and dazed in their behaviors. Typically, the eyes are open with a glassy, staring appearance as the person quietly roams the house. They do not, however, walk with their arms extended in front of them as is inaccurately depicted in movies. On questioning, responses are slow with simple thoughts, contain non-sense phraseology, or are absent. If the person is returned to bed without awakening, the person usually does not remember the event. Older children, who may awaken more easily at the end of an episode, often are embarrassed by the behavior (especially if it was inappropriate). In lieu of walking, some children perform repeated behaviors (for example, straightening their pajamas). Bedwetting may also occur. Sleepwalking is not associated with previous sleep problems, sleeping alone in a room or with others, achluophobia (fear of the dark), or anger outbursts. Some studies suggest that children who sleepwalk may have been more restless sleepers when aged 4-5 years, and more restless with more frequent awakenings during the first year of life. For children and adults, sleepwalking is usually a sign of lack of sleep, intense emotional problems, stress, or fever. As these conditions resolve, sleepwalking incidences disappear. In most cases, no treatment is necessary because sleepwalking rarely indicates any serious underlying medical or psychiatric problem. In most children, sleepwalking disappears at puberty. However, it can occasionally persist into adulthood or may even begin in adulthood. Consult a sleep specialist if the person is having frequent episodes, injuring himself or herself, or showing violent behavior. Usually, no exams and tests are necessary. However, a medical evaluation may be completed to rule out medical causes of sleepwalking. Additionally, one may get a psychologic evaluation done to determine whether excessive stress or anxiety is the cause of sleepwalking. Sleep study tests may be done in persons in whom the diagnosis is still unclear. Sleepwalking, night terrors, and confusional arousals are all common non-REM sleep disorders that tend to overlap in some of their symptoms. A percentage of young children through mid adolescence will experience some or all of these behaviors. Night terrors: Like sleepwalking, night terrors tend to occur during the first half of a night's sleep, often within 30-90 minutes from falling asleep. Also, like sleepwalking, night terrors occur during stage 3 sleep. However, unlike sleepwalking, an individual with night terrors will portray a sudden and often agitated arousal that may appear to parents as violent and terrified behaviors. Night terrors often start during the toddler years with a peak incidence between 5–7 years of age. During these times, evidence of a surge in autonomic nervous system activity is evident. Accelerated heart and respiratory rates, dilated pupils, and sweating are characteristic. Triggers for night terrors may include sleep deprivation, stress, or medications (stimulants, sedatives, antihistamines, etc.). Unlike sleepwalking, episodes of night terrors may recur for several weeks in a row, abate completely, and later return. Confusional arousals: Similar to night terrors, confusional arousals are characterized by a sudden and violent arousal from sleep with behaviors described as agitated and semi-purposeful in pattern. Speech is generally coherent (unlike in sleepwalking). A distinguishing point between night terrors and confusional arousals is the lack of autonomic nervous system phenomena in the latter. Confusional arousals tend to occur during the first half of a night's sleep (during stage 3). They are characteristically short-lived, lasting only 5 - 30 minutes in duration. Affected individuals typically have no memory of the event. 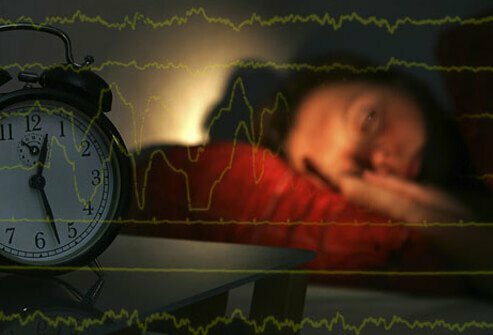 Nocturnal seizures: Several important differential points help delineate the above three sleep behaviors from seizure activity that occurs at night. Seizures by their nature are very brief, lasting often only a few minutes. In addition, seizure events likely to be confused with the above are characterized by a series of repeated, stereotypical, and frequent behaviors occurring in clusters. Importantly, seizures more commonly occur in the second half of the night's sleep. Patients often with have post-ictal (post-seizure) issues including headache, extreme grogginess, being hard to arouse, as well as incontinence of urine and stool. To assist in establishing a correct diagnosis a neurologist may perform a video-EEG study to help clarify the issue. Meditate or do relaxation exercises. Avoid any kind of stimuli (auditory or visual) prior to bedtime. Keep a safe sleeping environment free of harmful or sharp objects. Sleep in a bedroom on the ground floor if possible. To prevent a fall, avoid bunk beds. Remove obstacles in the room. Tripping over toys or objects is a potential hazard. Place an alarm or bell on the bedroom door and if necessary, on any windows. If sleepwalking is caused by underlying medical conditions, for example, gastroesophageal reflux, obstructive sleep apnea, periodic leg movements (restless legs syndrome), or seizures, the underlying medical condition should be treated. The possibility of injury is real. Continued behaviors are causing significant family disruption or excessive daytime sleepiness. Other measures have proven to be inadequate. Benzodiazepines, such as estazolam (ProSom), or tricyclic antidepressants, such as trazodone (Desyrel), have been shown to be useful. Clonazepam (Klonopin) in low doses before bedtime and continued for 3-6 weeks is also usually effective. Medication can often be discontinued after 3-5 weeks without recurrence of symptoms. Occasionally, the frequency of episodes increases briefly after discontinuing the medication. Anticipatory awakenings consist of waking the child or person approximately 15-20 minutes before the usual time of an event, and then keeping him awake through the time during which the episodes usually occur. Sleepwalking is not a serious disorder, although children can be injured by objects or falls during sleepwalking. Although disruptive and frightening for parents over the short term, sleepwalking is not associated with long-term complications. Do you sleepwalk, or do you know someone that sleepwalks? What treatment was effective for the sleepwalking?